The two-day basketball and entertainment festival that attracts 30,000 players and close to 200,000 fans. Could a similar event be staged in Seattle with similar results? 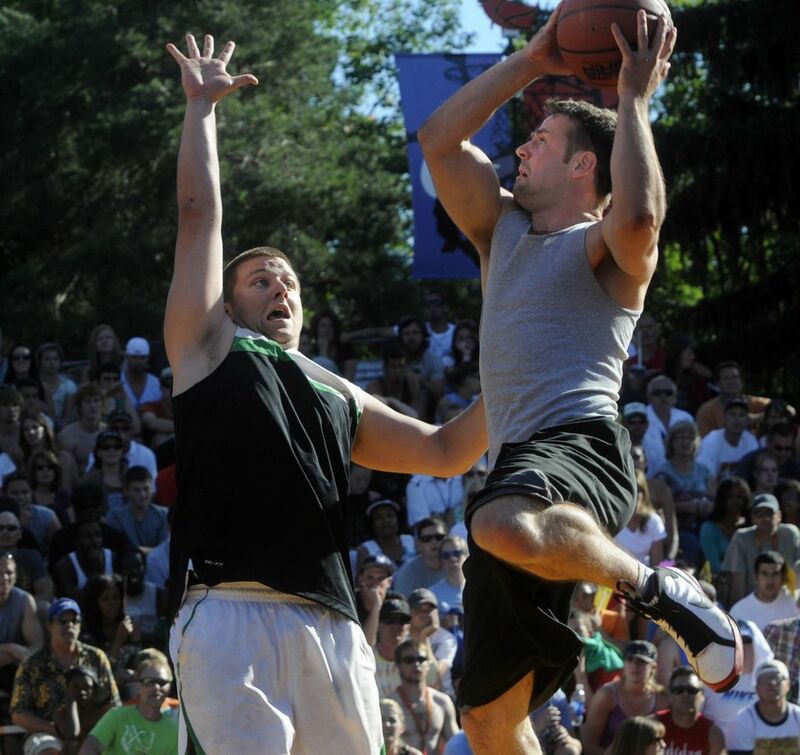 The Spokane Hoopfest celebrated 25 years of three-on-three street basketball in June. What began in 1990 as an idea to raise a little money for Special Olympics has now grown into the largest event of its’ kind in the world. The two-day basketball and entertainment festival that attracts 30,000 players and close to 200,000 fans. The organization’s website cites a survey that estimates fans and players pouring into Spokane for the weekend end up pumping around $39 million into the area’s economy. The event has donated $1.6 million to various Spokane charities since 1990. Could a similar event be staged in Seattle with similar results? To answer a question with a question: Why not? Last winter a group of area residents (this one included) first formulated the idea for a three-on-three tournament to be staged in the streets of Seattle with the combined goals of raising money for the Northwest Parkinson’s Foundation and Mentoring Works Washington, and honoring the work done in Seattle’s basketball community by Jim Marsh. When the pro hoops season begins this fall at least a dozen players born and raised here will dot various rosters around the league, and many of them were coached at one point in their youth careers by Marsh. While many people have helped paved the way for the influx of Puget Sound basketball talent into the NBA, it could be argued that no one has done more for kids interested in basketball in Seattle the past 25 years than Marsh. As the overseer of the Seafirst/Sonics Jammin’ Hoops camps in the 1990s, and also as an AAU coach, it’s impossible to calculate accurately how many young people he has influenced. In 2004, he was diagnosed with Parkinson’s disease which has obviously affected him but in no way dampened his enthusiasm for life or coaching kids. The first Hoops for Hope: Jim Marsh Classic will be held on Aug. 29-30 at outdoor courts set up in Seattle’s Georgetown neighborhood. Food trucks will offer a variety of cuisine and Georgetown’s many restaurants and bars will all be within walking distance of the action. There will be live music and vendor booths. For fans of the game it will be a chance to watch players from the next generation, or the one after that, who might one day play professionally. You might see the next Spencer Hawes, Martell Webster, Isaiah Thomas or Zack Levine. For that matter, you’ll likely see all of those actual guys at the tournament as they continue another great Seattle basketball tradition of keeping an eye on the kids behind them and offering help whenever they can. There are divisions for all ages and ability, so the tournament won’t just be limited to future NBA stars. Seattle has a large contingent of rec-league players, many of whom are expected to join in on the fun. In short, the weekend is shaping up as one big Seattle basketball party. But in addition to that players will be looking to get better, and according to Romar, they’ll be doing so almost accidentally. The long-term goal is for the Jim Marsh Classic to become a fun and important part of Seattle’s basketball culture. Events like this one (and Jamal Crawford’s all-star game earlier this summer at KeyArena) are important in helping to keep the basketball community in Seattle alive and thriving, connected and growing. It’s the first year and as you might imagine help is needed everywhere. Certainly more teams are needed. Boys, girls, men, women. Volunteers. And fans. You can get information on all aspects of the tournament at Jimmarshclassic.org. The idea of the Jim Marsh Classic becoming as big in Seattle as Hoopfest is in Spokane is a bit staggering and perhaps even preposterous. Hoopfest is legendary and will likely continue to grow, but there’s no reason Seattle can’t aspire to have a similar event. Anything that brings people together to play basketball while generating millions of dollars for the economy and local charities is worth trying to duplicate. That effort begins this year in a city that’s always had plenty of basketball talent and passion. Both will be on display in Georgetown on Aug. 29-30. Mike Gastineau spent 22 years as the afternoon host on Sports radio 950 KJR, retiring in 2012. Since then he has written a book about the Sounders (“Sounders FC: Authentic Masterpiece”) and spent time working as a freelance broadcaster, writer and consultant. He recently joined the team at the Boeing Classic golf tournament in a media-relations and marketing role. He is on the Board of Directors for the Jim Marsh Classic.